As a swimmer or a triathlete in training, where do you do most of your swim training? 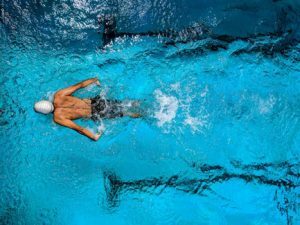 Unless you regularly swim in open water, you most likely do most of your swim workouts in the pool. And, the pool you swim in is most likely cleaned with chlorine. Chlorine is relatively safe for us, but over long periods of time, it really can damage your hair color and strength. You might have tried all the tips such as showering before swimming and wearing a swim cap, but that doesn’t get rid of all the chlorine your hair soaks in. It’s very important that you choose the best shampoo for chlorine removal so that your hair has the best treatment and stays healthy. There are a handful of brands that are making swimmer specific shampoo to help reverse chlorine damage and help protect against future damage. In this article, I’ll provide a buyer’s guide and a review of the top swimmer shampoos for chlorine removal. 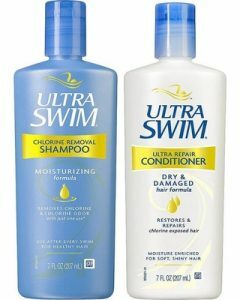 Ultra-Swim Shampoo and Conditioner is one of the best solutions for your swimmer’s hair. It repairs your chlorine damaged hair and gives your hair its vibrancy and color it once had. The accompanying conditioner moisturizes your hair while repairing your split ends. The formula targets the outer layer of your hair, where it is the most vulnerable. The shampoo formula contains natural ingredients such as Vitamin E and Aloe to nurture your hair while it gently removes the chlorine from it. If you have lighter hair, the shampoo helps remove copper and other oxidized metals, so you won’t have to worry about green streaks. Even if you have colored, treated, or perm set in your hair, the shampoo is gentle on it while it removes chlorine and other metals. The complementing conditioner helps keep your hair glowing and makes it easy to comb after a swim. By the time you’re done showering and putting on regular clothes, your hair will have its natural glow and will be frizz-free. I recommend this chlorine removal shampoo since it has an accompanying conditioner that enhances the shampoo’s effect. It’s a great all-around product and is safe to use for all types of hair, even if it’s treated. The only downside is that the consistency is thinner than other ones so you might need to use more than a dab. Paul Mitchell is one of the top brands recommended for chlorine removal. It helps get rid of chlorine, copper, and other oxidized chemicals that build-up and prevent future build-ups. The formula also tries to strengthen your hair from the chlorine damage. The formula is strong enough that you don’t need to put a handful of it in your hair. Just a dime size or smaller will do. The shampoo can easily spread through thick and long hair. After massaging the shampoo from the root to tip of your hair, just rinse and you’re good to go! You should feel a difference as soon as you remove the shampoo from your hair. If you have treated hair, you can use this product, but not on a daily basis. The ingredients could damage whatever treatment you put in it. If you don’t have treated hair, this product can be used daily if you want. This brand is paraben free and uses vegan ingredients. This might be a good brand if those features are important to you. Paul Mitchell is a well-respected brand in hair salons and I recommend it as a solution to your swimmer’s hair. It will effectively remove any build up you have and even help prevent future ones. Unlike other brands, this one actually helps you get rid of green streaks instead of just preventing new ones from coming in. The only downside to this shampoo is that it leaves your hair feeling dry. The formula is really strong so it might take some of your hair’s natural moisture too. If this happens, you can always use a conditioner to help. 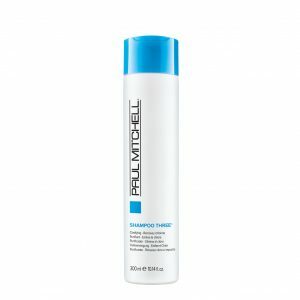 Malibu has nearly all the benefits of Paul Mitchell Three Shampoo, but in a calmer formula that doesn’t have aggressive cleansing agents. Malibu’s formula is designed to gently remove chlorine, copper and other heavy oxidized metals and even helps prevent dryness. You might even notice your hair feeling like its “normal self” again. It’s recommended to use a dime or nickel size amount of the shampoo in your hair. Massage it from root to tip and then rinse completely. After using the shampoo, you might notice a difference in your hair, it will look and feel like you didn’t swim. In fact, it might take it a step further and make your hair so healthy that people won’t believe you’re a swimmer. I cannot recommend this brand enough! It’s really gentle on your hair while it works hard to remove the chlorine and other oxidized metals. You won’t have the compromise your moisturized hair for having chlorine-free hair. Even if you have treated hair, you can use this every time you swim and it won’t affect it. Solpri created its one-of-a-kind shampoo to help those who have sensitive skin, allergic to perfumed shampoos or develop dry skin and a rash from swimming. This shampoo solves all those problems and helps nurture your body’s skin and hair with its high-quality ingredients. You can use all three of its products (shampoo/body wash, conditioner, and lotion) to get the most out of your skincare routine. Although, using just the shampoo and or conditioner will suffice. The Vitamin C in the shampoo/body wash helps break down the chlorine on your body and hair. The Vitamin C, MSM, and aloe work wonders to make your hair look and feel smoother and softer. Best part, the shampoo won’t dry out your hair even after it gets rid of the chlorine. The accompanying conditioner, made with vegetable oils, has a strong acidic pH to help balance your hair’s pH level. This formula also helps to restore your hair’s natural moisture and shine. The conditioner’s amino acids also help fight against future chlorine build up. Those amino acids make your hair stronger for the long-run. After, you can use Solpri’s lotion for swimmers, but any lotion with Vitamin C will help moisturize your skin after your shower. And, if you missed any chlorine spots, the Vitamin C will take care of that. I’d recommend this shampoo to those who want a shampoo and body wash combined. It simplifies what you need to take pool with you. If you have sensitive skin, this shampoo is gentle on the skin while removing the chlorine. I don’t recommend using this on a daily basis since it removes your hair’s natural nutrients. Just use it on the days you swim. Or, if you swim every day just use it every other day. Doesn’t have a strong scent. 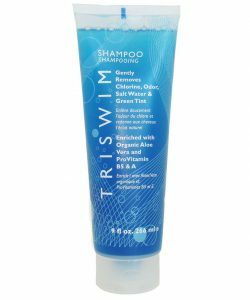 TRISWIM does it all: removes chlorine from your hair, repairs damaged hair and prevents new build up. After using TRISWIM, you could have soft and moisturized skin and clean and healthy hair. The shampoo has Aloe Vera, which is a popular plant used for its moisturizing, soothing, and alleviating effects. The other ingredients such as Vitamin A and Pro-Vitamin B5 helps keep your hair hydrated and prevents your hair from looking flat against your head. All these ingredients work hard to remove Chlorine, Bromine, Salt Water, Hard Water Minerals, and even the chlorine odor. The formula even has chamomile and watercress which helps if you’re prone to dandruff or have a dry and itchy scalp. Although the formula is aggressive to get out the chemicals, it’s gentle and can be used on treated and permed hair. I’d recommend this product to anyone who wants to get the chlorine out of their hair and help strengthen it. All the vitamins and Aloe-based ingredients help give your hair its natural shine and feel back. The negative comments relate to how long that person used the product. You might not see results instantly so use the shampoo on a regular basis. Be warned that the packaging is actually flimsy. Be sure to put the shampoo in a plastic bag when you take it to the pool or put a small amount into a travel-sized container. 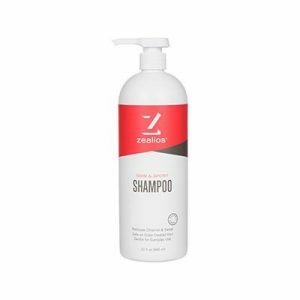 The name of the shampoo spells out what it does: it helps prevent chlorine damaged hair before you even have it. Other shampoos only help after you’ve damaged your hair. While this one takes a proactive approach. Aqua Guard understands how aggressive chlorine and other chemicals can be on your hair. Normally, all your hair’s natural oils are sucked out leaving your hair brittle and hay-like to the touch. Chemical build-up weighs down your hair to make it look limp and dull. And, you can forget about your original color if you’ve dyed or treated your hair. And, finally, if you have light hair, you see green streaks appear. 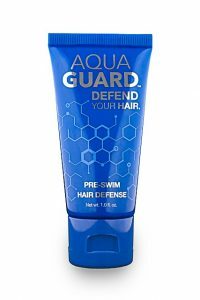 Aqua Guard works hard to combat all these swimmer’s hair problems before they even show up! It works gently and keeps your hair looking healthy, shiny, and strong! The shampoo’s formula is designed to “close off” your hair cuticles so that it protects against mineral deposits and loss of natural oils. You’ll see the difference as soon as you rinse it out of your hair. And, even more, benefits the longer you use the shampoo. To use this shampoo effectively you apply it before you even enter the water. That’s the biggest difference between Aqua Guard and other brands. It’s recommended to dampen your hair, apply a generous amount to your hair, especially on the ends, and then do your swim workout. Aqua Guard strongly suggests waiting 3-5 minutes after you’ve put the shampoo in before going into the pool. The shampoo works whether or not you wear a swim cap. I’d recommend this product to anyone who wants to prevent swimmer’s hair before it happens. Or, need a stronger solution if the damaged has already been done. You must follow all the directions for the shampoo to work. Letting the shampoo “soak” for 3-5 minutes after application actually makes a difference. It allows the shampoo to work and settle into your hair. I do recommend wetting your hair before applying, which could make it feel less heavy on your head. 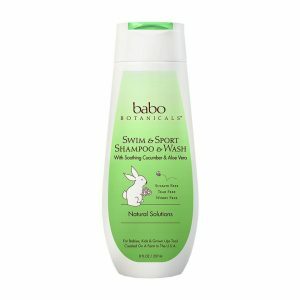 Babo Botanical is an all-natural shampoo that uses plants or plant extracts to help remove chlorine build-up. It leaves your hair shiny, full of life, and most importantly, chemical free. Babo Botanical makes all its products with a Nutri-Soothe Complex formula, which is full of vitamins, anti-oxidant’s and anti-inflammatories. This shampoo contains the Nutri-Soothe Complex along with organic calendula, chamomile, kudzu, watercress and meadowsweet to help clean and soothe sensitive skin. The shampoo’s cumber extract and aloe barbadensis leaf juice is great for helping restore your skin’s moisture after swimming laps in the pool. These ingredients also give moisture back to your hair. Organic meadowsweet flower extract, another active ingredient, is an antiseptic and anti-inflammatory herb. This helps “kill” chlorine and other oxidized metals built up in your hair. Organic water crest flower/leaf extract, one of the last active ingredients, contains many vitamins that help your hair become stronger and healthier after the chlorine has been removed. I recommend this product for those who want an all-natural solution to chlorine damaged hair. It helps to remove the chlorine using plant-based ingredients, which can be good if you’re sensitive to perfumed shampoos. Since this shampoo can sometimes leave your hair dry, I recommend using a complementary conditioner to go along with it. You can research which ones would work with the brand and for you personally. Just to note, most shampoos are a cleansing tool and some do both cleaning and moisturizing. Don’t be too surprised if a shampoo doesn’t moisturize your hair, it’s not designed that way. Zealios worked hard to create its formula so that it never looked like your hair touched chlorine. The company made the formula so that it removes chlorine, heavy minerals, and salt without stripping your hair of its natural oils. Since the shampoo doesn’t contain any sulfate, you can use it if you have treated or colored hair. The Vitamin B strengthens your hair follicles and keeps your hair looking great. The Vitamin B brings your hair back to life, repairs your split ends, and even strengthens your hair so it won’t look brittle. If you swim every day, you don’t have to worry about chlorine build-up between washes. The formula is effective yet gentle enough for daily use. Doesn’t matter if you swim out in the sun, in a salty ocean, or a pool, the shampoo works to protect your hair and restore its health, no matter what you put it through. The Vitamin B also does a great job of protecting and strengthening hair follicles, even if you decided to dye your hair. You’ll be able to have your natural color back at some point. Finally, the last feature mentioning: this shampoo and brand is vegan, gluten-free, and cruelty-free. The gentle shampoo formula is made from natural ingredients such as aloe vera, borage oil, and purified water. After swimming, apply this shampoo and massage it from root to tip. Let it sit in your hair and then rinse it out. Your hair could feel better after the first or possibly second wash. Don’t give up, consistent use often helps. I recommend this product if you’re looking for an all-natural and aggressive solution to your swimmer’s hair. It really helps get whatever build-up is stuck in your hair, which makes it a great option if you swim in both open-water and pools. You can be sure that your hair will stay protected no matter where you find yourself. Since the shampoo’s formula is made from natural ingredients, you can use it if you have treated or dyed hair. Be warned that the formula is really aggressive and can strip your hair of its natural oils while removing chlorine. If that is a concern, be sure to get a complementing conditioner. 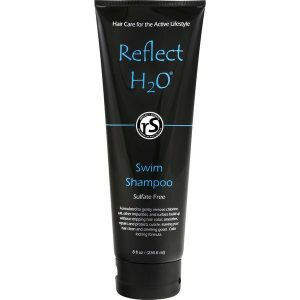 Reflect Sports Shampoo helps remove chlorine and other oxidized chemicals building-up in your hair. It works especially hard to help remove the green streaks from blonde hair starting to appear. The shampoo formula is sulfate-free so you can use it if you have treated or dyed hair. The sulfate-free formula works to calmly remove pool chemicals and any build-up without robbing your hair of its natural ingredients. Instead, the formula calms, repairs, and protects your hair from the chemicals in a swimming pool. It also helps clean your hair whenever you have an open water practice. The shampoo’s finishing touch is its cantaloupe and citrus scent. You can swim and then feel fresh like an orange from a tree. To make this shampoo work, use it immediately after you swim (even if it’s daily, it will be safe). Massage the shampoo in your hair from root to tip and let it sit there for a few minutes. Rinse thoroughly so that it the extra shampoo won’t weigh your hair down. The shampoo is gentle and effective enough that you could use it as a body wash, especially if you like the scent. I highly recommend this brand to anyone who has treated or dyed hair and is in the water at least a few days a week. If you have light colored hair, you can treat your green streaks with this shampoo. Give it a couple of weeks to work and you’ll see results. Swimmers hair occurs when you’ve been swimming regularly and the chlorine starts to damage it. Chlorine slowly drains your hair of its natural oils and can cause your hair to fall out more easily. Chlorine damaged hair becomes brittle, easy to break, and feels rough. While, most blonde-haired people end up with green streaks, nearly all colors of hair get some type of green if it’s been exposed to large amounts of chlorine. The chlorine damages the cuticles of your hair so that oxidized metals such as copper can hang out there. Those oxidized metals turn your hair green. By the time you’re ready for swimming in open water in the spring, your hair will need some type of repair if not sooner. 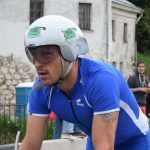 Why Do Swimmers and Triathletes Need Shampoos for Chlorine Removal? You need to remove the chlorine for your hair to be happy and healthy again. And, to have its natural bounce and vibrant colors. You won’t notice it since chlorine damage is a gradual process, but your friends might when it’s spring and you’re not wearing a thermal hat all the time. Besides having your hair looking healthy, it actually needs to be healthy. Your hair can start falling out or breaking off if it becomes too damaged from chlorine. Even if you have stopped swimming in pools, there is still small amounts left in your hair that can still cause havoc. Why Is It Important to Choose the Right Shampoo? Remember, you need to help your hair become healthy again and remove all traces of chlorine. You need a shampoo that will help you achieve your healthy hair goals. The shampoos you see in the local drug store might smell nice, but it might not have the right ingredients that kick out chlorine from your hair. In fact, it could do more harm than good. The wrong shampoo might provide a temporary fix, but you need something that will keep up with your vigorous swim schedule. When you’re looking for a swimmer’s shampoo, whether it be in a drug store or salon, look for ones that will help moisturize your hair. And ones that target the outer layer of your hair and the ends, where most of the damage is found. Bonus if the shampoo has ingredients such as aloe and any type of vitamin which help gently remove the chlorine from your hair and even the pool smell. These ingredients are also good to look for if you have a sensitive scalp or don’t like perfumed shampoos. Try to look for shampoos that not only repair damaged hair but also prevent it from happening again. If worse comes to worst, you can cut some of your hair and it will grow back healthy. Keep yourself and your hair happy and healthy this training season! We hope that this article helped you pick or sample a couple of brands to combat swimmer’s hair.